Our group will be presenting Xilinx SDSoC for acceleration of real-time Video Processing on EMC2 Development Platform, using Zynq SoC System-on-Modules at HiPEAC 2016 conference held in Prague 18 – 20 January 2016 at the Second EMC2 workshop Mixed Criticality Applications and Implementation Approaches. SAMOS XV conference was held in Agios Konstantinos, Samos Island, Greece 20 – 23 July 2015. We have presented paper Video Chain Demonstrator on Xilinx Kintex7 FPGA with EdkDSP Floating Point Accelerators. Slides. Our group presented recent results at the IPSOC 2014 conference held in Grenoble 4 - 6 November 2014. 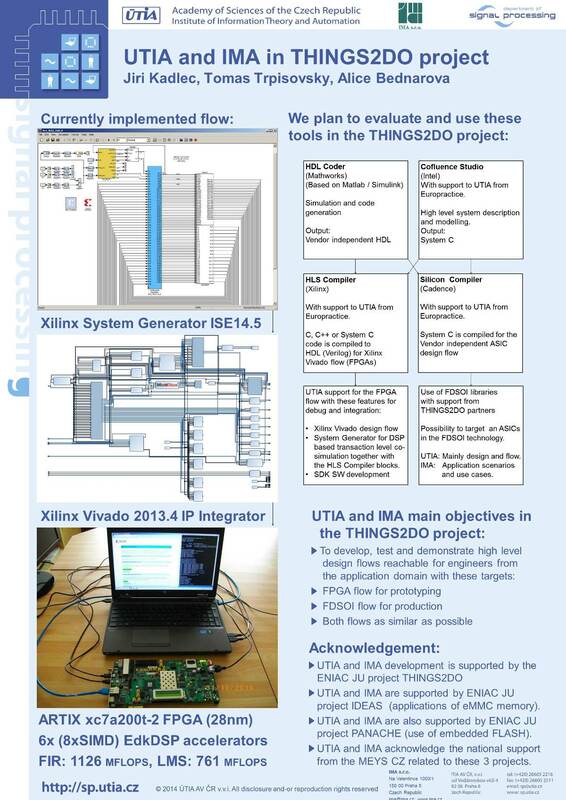 At the Things2Do project booth, we presented a poster describing the evaluation design on Artix7 FPGA and the related design flow in the Xilinx Vivado 2013.4 IP Integrator. Our group presented recent results at the EMC2 Market Place held in Oldenburg, Germany, from September 29th to October 2nd. We presented the asymmetric multiprocessing demo on ZYNQ. Our group is a member of the consortium of the ENIAC KET Pilot Line project called PANACHE. The project objective is to set-up a pilot line for embedded Flash technology design and manufacturing platform for the prototyping of innovative μcontrollers in Europe. The Kick-off meeting was held at STMicroelectronics on June 25, 2014 in Crolles, France. More information can be found here. Our group takes part in the ENIAC KET Pilot Line project called Things2Do. This project is building the Design and Development Ecosystem for FD-SOI-technology. The Kick-off meeting took place at STMicroelectronics on June 20, 2014 in Grenoble, France. Detailed information can be found here and on the project website.